Every now and then I get a group of friends together and we go for what I call "A Forage on the Foreshore". Yesterday the weather was forecast as 6ºC but bright and sunny, so a few of us including Caroline and Malcolm met up under the south side of Battersea Bridge. Having enjoyed it there last time, this time we did the same walk in reverse, continuing westwards almost to the railway bridge and then retraced our steps halfway back again to return to street level via the slipway next to the old church. 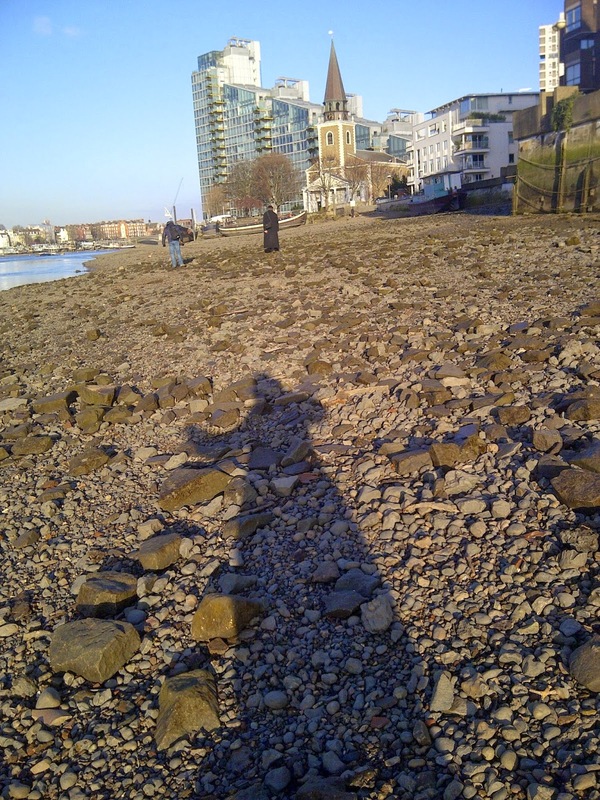 The beach at Battersea is mostly shingly and pebbly but there are some interesting old things to be spotted by the eagle-eyed. As seen under my shadow here, the foreshore is littered with old building bricks, and many of them have names embedded in them. At first, seeing so many with the name RAMSAY on them we thought there must have been a brick-making factory on that site, but moving on we found lots more names, including NETTLE and THISTLE (nice) so I now think these are the remains of some demolished buildings, especially as some of the fancier shaped pieces had numbers on them which, I'd assume, were identification codes for the builders as to where they should be placed. More ideas about this are welcome. Considering how many Ramsay bricks we saw it's hard to fathom how I didn't capture one. Of the others, Thistle, Nettle, Sneyd, Douglas, Brandon and Stephenson were easy to read but the last three aren't so clear – Cliff(something)–Worth(sonething), Phorpres? and John Steve(ns/son)? 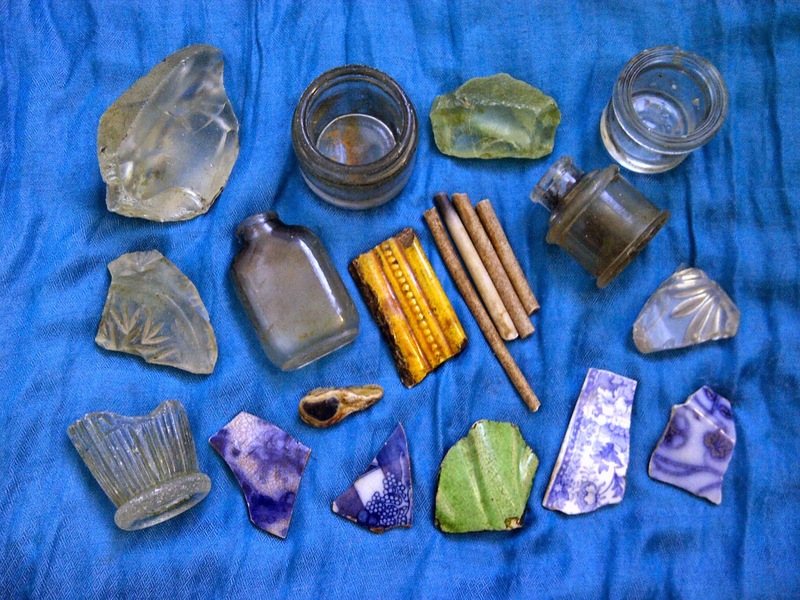 Further along, near four house boats moored parallel to the shore, we found a lot of glass – big chunks with metal bits embedded within, etched fragments, broken and tide-tumbled pieces, little medicine bottles and jars, and one ink bottle with its stopper inside. Here are some of the finds I brought home including four clay pipe stem fragments that will probably end up in a necklace, and some nice old bits of pottery which I have yet to date. If you'd like to join us for a forage just contact me via my other site here. A nice afternoon stroll along the foreshore. Your penultimate brick is indeed Phorpres - one of the most common bricks in the country and a product of the London Brick Company. It is a phonetic stand-in for 'four pressed', how the bricks themselves were made. Thanks again for a lovely walk! 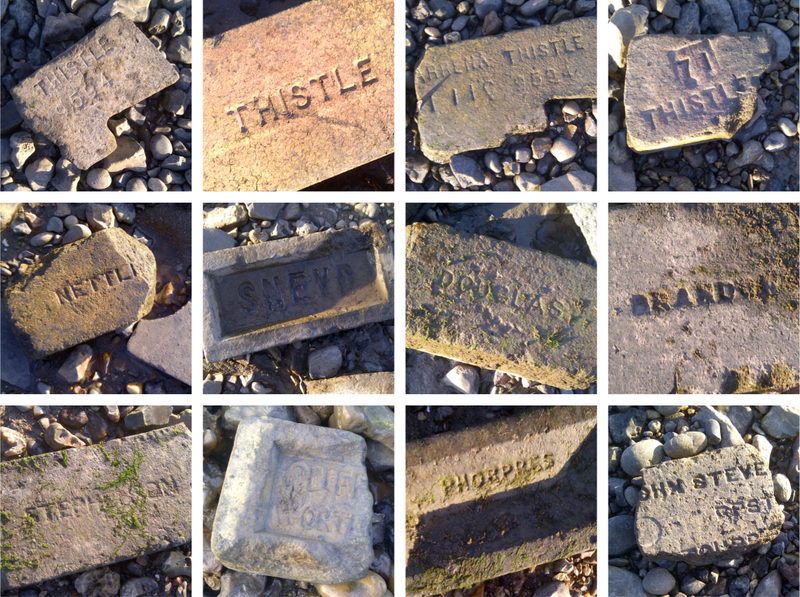 After all the brick-spotting, I found this site which lists and gives information about huge numbers of brick manufacturers whose bricks are found along the Thames. Forpress! that's great. Thanks fpr the info Moquette.